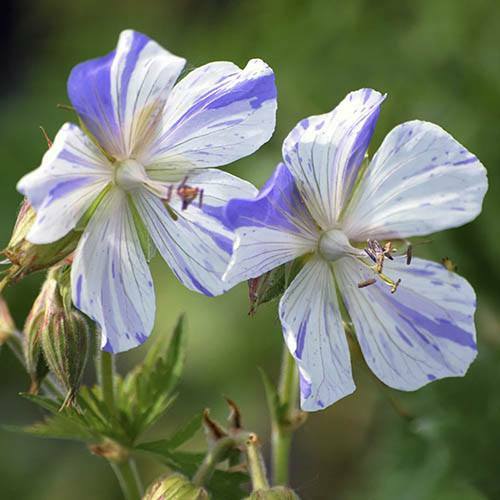 Splish Splash is a stunning form of Geranium pratense that bears a mass of striking striped single blooms in May and June. So neat are the petal markings that they could have been painted by hand! Cut back after flowering and you'll usually be rewarded with a second flush of blooms in autumn. Splish Splash is a stunning form of Geranium pratense that bears a mass of striking striped single blooms in May and June. So neat are the petal markings that they could have been painted by hand! Cut back after flowering and you'll usually be rewarded with a second flush of blooms in autumn.